Colorado’s major party U.S. Senate candidates held their only televised debate of the election on Tuesday night – but it was disrupted by minor party supporters. 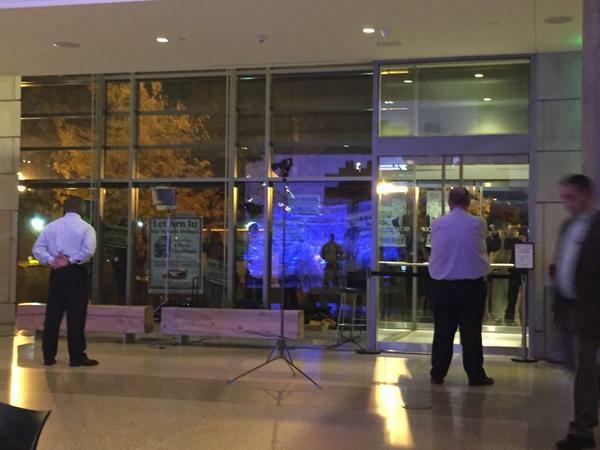 About two dozen Green Party supporters stood outside the History Colorado Museum in Denver where the debate was held, pounding on the glass doors for 60 minutes. The noise was clearly a distraction for the audience and for incumbent Michael Bennet, a Democrat, and El Paso County Commissioner Daryl Glenn, his Republican challenger. “Some folks are exercising free speech outside by using the building as a base drum,” said 9News moderator Kyle Clark. To be invited to participate a candidate needed 10 percent support in two independent polls. None of the third-party candidates reached that threshold. Clark asked Glenn why in recent days he has gone from supporting presidential nominee Donald Trump to urging him to drop out of the race to then suggesting that he would back Trump again. The context was video showing Trump making lewd comments about women 11 years ago. “We should never disrespect women, I grew up in a family with domestic violence,” said Glenn. He said his support for Trump has waffled but that he also believes in repentance and seeing what’s inside someone’s heart. He said Trump is a member of the Republican family. Glenn clarified on Tuesday, that he’s not saying whether he is supporting Trump until after he meets Trump in person. “I have absolutely suspended my endorsement of Donald Trump." Glenn added that Bennet is hypocritical for not criticizing Democratic presidential nominee Hillary Clinton’s mistakes, such as using a private e-mail server and calling some of Trump’s supporters’ "deplorables." During the hour-long debate Bennet defended some of his actions in office, including his support of the Iran nuclear deal. He said he believes it was the right vote, but tough politically. Bennet still stands behind the Affordable Care Act - despite rising health care costs and premiums for many Colorado families. He advocated for more transparency and competition. “I believed back when we passed this the first time that we should have a public option for our people to be able choose from if they want that, and I still believe that,” Bennet said. It’s a stark difference from Glenn who said he wants to repeal Obamacare and replace it with a competitive marketplace across state lines and encourage market growth. On one issue, Glenn moved closer to Bennet. He reversed his stance on banning all Muslims from entering the United States. Glenn now believes a religious test is too broad to bar entry. The two candidates also agree that each of them is best suited to bringing unity back to Washington D.C., in the wake of the divisive presidential election. It was something they touched on in their closing statements – starting with Bennet. “What I want is a politics that’s worthy of the aspirations we have for our kids and our grandkids,” said Bennet. “That’s an example I’ve tried to set in the first term that I’ve been your senator. That’s what I will continue to do if you give me that privilege." For a purple swing state that was expected to have a close Senate race nationally, Colorado has been fairly quiet. Bennet has a sizeable lead in polls while Glenn doesn’t have strong statewide name recognition. Glenn has raised a fraction of the amount of money compared to Bennet. The main party candidates in Colorado’s U.S. Senate race square off Tuesday for their only televised debate. 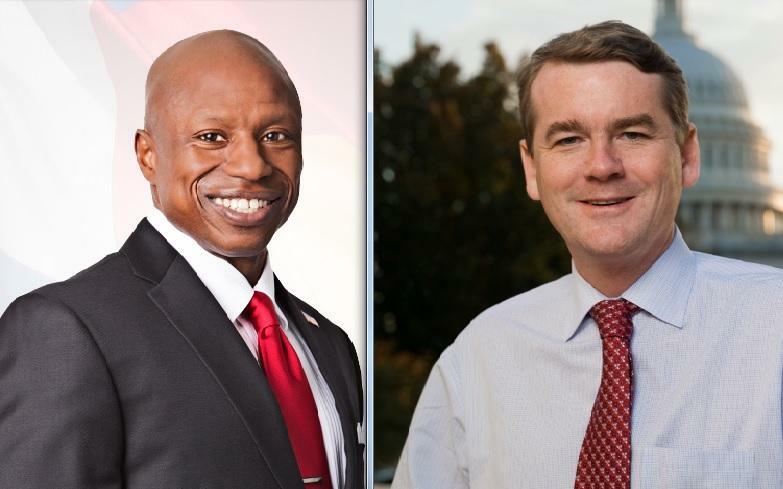 The interest in the battle between the incumbent, Democrat Michael Bennet, and his Republican challenger, Darryl Glenn, so far has been low-key. That’s especially the case when compared to two years ago when Mark Udall, a Democrat, was defeated by Republican Cory Gardner in one of the most-watched contests in the country. Republican Donald Trump and Democrat Hillary Clinton face off in the second presidential debate Sunday night at Washington University in St. Louis, Missouri. NPR's politics team, with help from reporters and editors who cover national security, immigration, business, foreign policy and more, is live annotating the debate. 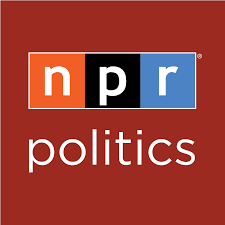 Portions of the debate with added analysis are highlighted, followed by context and fact check from NPR reporters and editors. 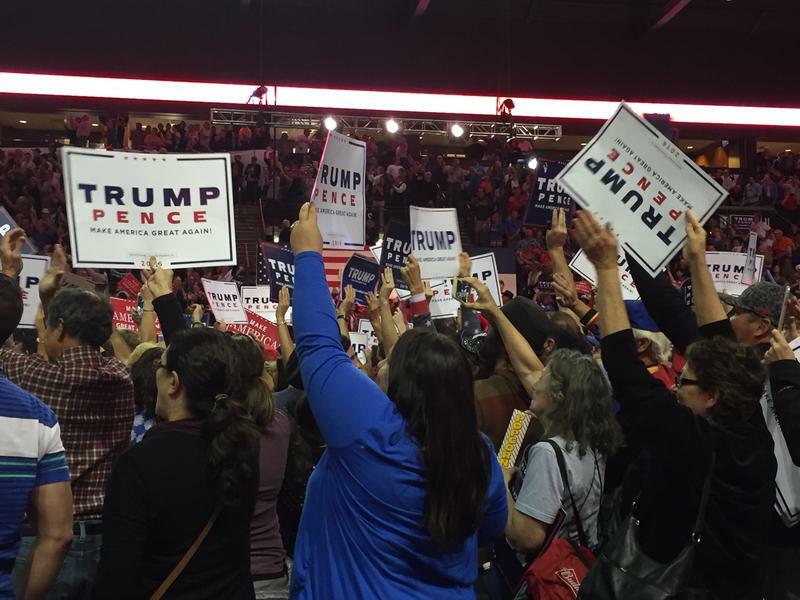 LOVELAND, Colo. - Ashley Harrison held her baby son in a sling as she stood in line for the Donald Trump rally on a windy but warm fall day in Colorado. She’s a part owner of two 7- Eleven stores in Windsor and Milliken. She thinks Trump would give them tax breaks.